Fifteen acres of beautiful landscaped gardens with 7000 plants, shrubs and trees and some of the finest plant collection in the Midlands including National Bonsai Collection. 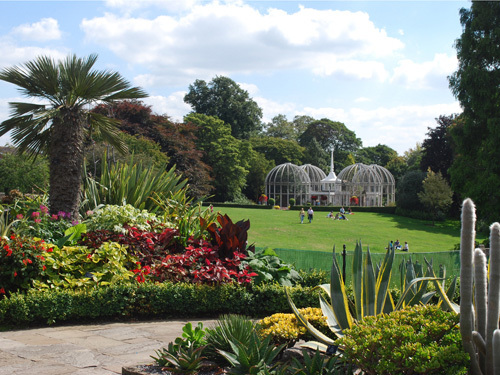 Four glasshouses contain a wide range of exotic plants and economic flora (e.g. sugar, coffee, tea). Children's Playground and Growing Schools Garden; live music and open-air theatre during summer; well-stocked gift shop; plant sales; art gallery; tearoom; parking. April to September 6.00pm. Weekdays, 7.00pm Weekends. Bus: nos. 10, 21, 22, 23, 29 and 103 from city centre to Westbourne Road and Harborne Road. Car/coach: from M5: leave at Junction 3 and take A456 towards city centre. Turn right on to B4129 (Norfolk Road), follow signposts to Botanical Gardens. from M6: leave at Junction 6 and take A38 (M) to city centre. Follow underpasses signposted Birmingham West to A456. At Five Ways island turn left onto B4271 (Calthorpe Road) and follow signs to Botanical Gardens. Cars: car park on site. Coaches: coach park on site.